In 1988, a ministry for HIV/AIDS orphans was established in a small home by a local family. No needy child was ever refused. The full-time ministry was eventually relocated to a farm with a full hospice center and a church. It was owned by Caucasians and they cared for orphans, widows, the elderly, and the sick. In 2001, the Caucasians were evicted from their farm. By 2005 they were blessed to meet an American who connected them with OFA in order to rebuild their social outreach. That year OFA began a partnership with this family to care for the orphans. The name of their organization and their location are not publicized on the Internet for security purposes. During the spring of 2006, OFA was able to provide funding to purchase land to eventually build a home for the family and the orphans in their organization. For many years the partnership with OFA resulted in monthly provision for rent (until a home could be built), food, school fees and all supplies. During difficult times surrounding the 2008 elections, the ministry was unable to communicate and was homeless at times. Three of the hungry children died after eating poisonous tubers similar to their native madhambe. Calm was eventually restored in the country when the election was over. Communication continued to be challenging due to frequent power outages in Zimbabwe. In 2009, they were evicted for not paying rent for three months, and so sought temporary refuge at a local community church hall. During that same year, the organization leader passed away due to poor health. One of his son's has taken his place and along his mother, he continues to serve the orphans. For over two years OFA has transferred funding incrementally to construct a very basic home for the children. The home was completed in 2011. OFA continues to provide assistance regularly for the children's food and school fees. All of the children are presently in good health and attending school. For many years the widow caring for the children has suffered from coronary artery disease. OFA-USA provided assistance with tests and medicine. In 2017 OFA-USA collaborated with other donors to enable this widow to undergo successful surgery in India. We are grateful to all of the supporters who made this possible. Our current goal in this partnership is to provide assistance to set up a micro-enterprise project for the purpose of generating revenue for our partner's orphan care work. 72% of Zimbabweans live in extreme poverty. The average yearly income is $680 US. 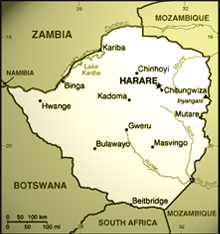 Zimbabwe is home to 13.7 million people with an average life expectancy of 56 years. 1.4 million Zimbabweans are living with HIV. There are 1.3 million orphaned children between the ages of 0-17; 1 million as a result of HIV.